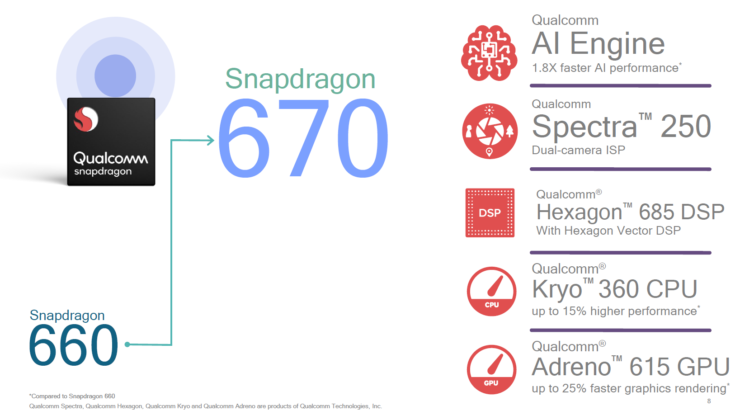 Qualcomm officially introduced the Snapdragon 670 today, with the latest entrant in the 600-series mid-range lineup aiming to bridge the gap between the 600 series and the recently introduced Snapdragon 710. 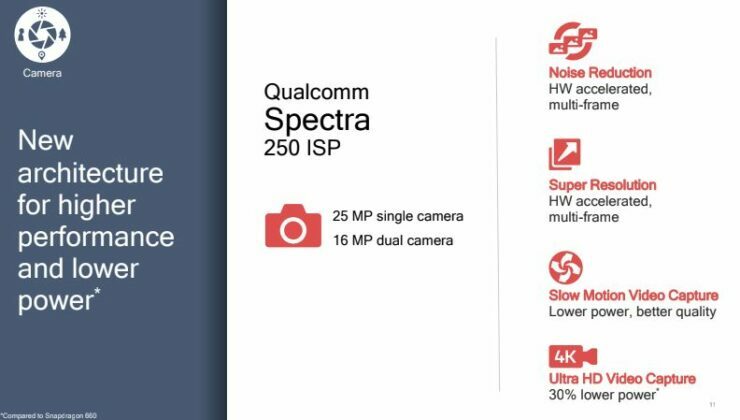 The Snapdragon 710 was the first SoC to be released under the new Snapdragon 700 tier of chipsets and it was aimed to fill the gap between the Snapdragon 600 and 800 series by introducing many of Qualcomm’s flagship features at an affordable cost. 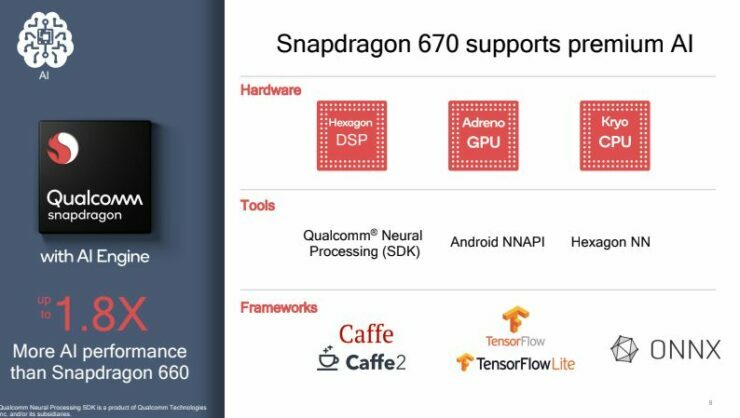 The new Snapdragon 670 has the same CPU configuration as the Snapdragon 710. 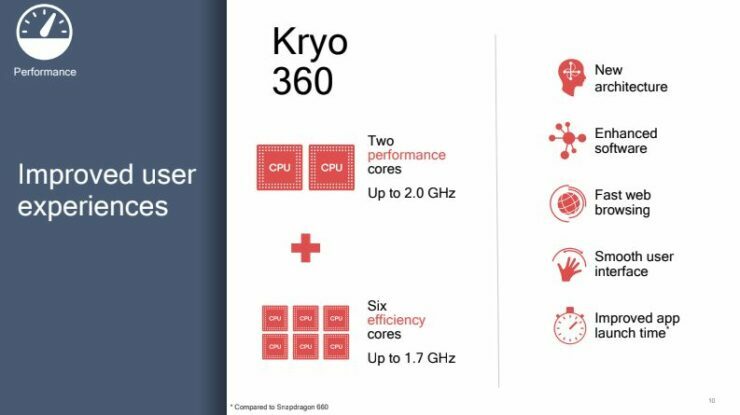 The Kryo 360 efficiency and performance cores are based on the Cortex-A55 and Cortex-A75 IP designs, respectively. The two performance cores running at a speed of 2.00GHz, while the more efficient cores, which are present in a total number of six are running 1.70GHz. Unlike the Snapdragon 710 which has the Adreno 616 GPU, Snapdragon 670 has the Adreno 615 which will lag behind the Snapdragon 710 in terms of graphical performance. However, there will be a 25 percent performance upgrade over the Snapdragon 660. Additionally, the DSP and ISP of the new chipset are similar to those of 710’s design-wise but they are inferior and consequently support a lower maximum resolution. The Snapdragon 670 doesn’t provide 4 x 4 MIMO support on the modem and so the Snapdragon X12 LTE modem will offer lower download speeds that will peak out at 600Mbps compared to 800Mbps on the Snapdragon 710. 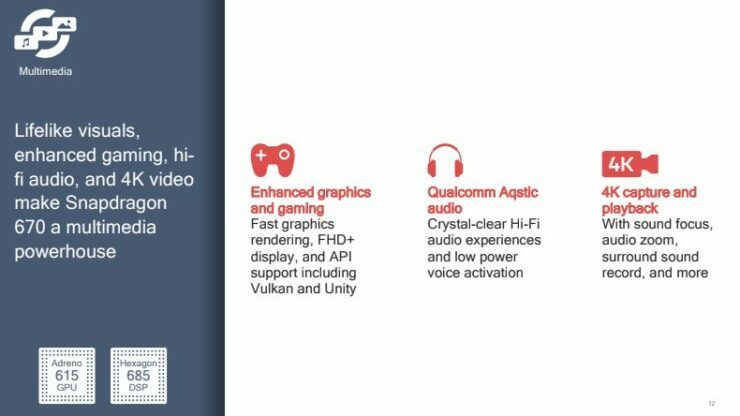 The Snapdragon 670 will also forego HDR capture support and the display controllers can only offer FHD+ resolutions. Luckily, the Snapdragon 610 is made on the 10nm LPP process node, so it will display power efficiency. The Snapdragon 670 may seem like a re-branded version of the Snapdragon 710, but Qualcomm says it features a different design. The market at the lower range which Qualcomm seems to be targeting with the Snapdragon 670 is fiercely competitive and the company’s decision to introduce its latest silicon was most likely driven by customer demand. The Snapdragon 670’s pin and software are compatible with the Snapdragon 710 so vendors can easily choose between the two with minimal engineering efforts. Qualcomm did not announce the list of the devices that will feature the Snapdragon 670, but whichever models they are, you can expect them to deliver a great deal of performance while going easy on the customer’s wallet in unison.